First off, wow, what a line up! This is the most members maiden have ever had at one time in the band. 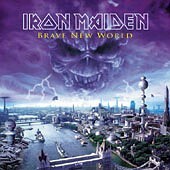 And, as most of you know, it marks the return of vocalist Bruce "Air-Raid Sirens" Dickinson and guitarist Adrian Smith. They mark the first band since Lynyrd Skynyrd to use a three man lead guitar act, and the first I can think of in the Metal genre. Maiden said that this is not a reunion album, but more of an all new Maiden sound to continue the legacy they once started. Does the new maiden line-up and album live up to the Maiden of old? In some ways, yes, and in some ways, no. "The Wickerman," an idea from a British movie dealing with paganism, starts the journey off with a nice little rocker that Adrian Smith co-write, with nicely written guitar progressions around Bruce's layered vocals. "Ghost of the Navigator," which Bruce wrote and deals with a captain and his emotional battles at sea, starts off the more X-Factor/Virtual XI intros that lead up to a powerful chorus and/or climax later on. "Brave New World" continues the same route, with a beautiful intro, as Bruce's vocals shine through out in a sing-along fashion. "Blood Brothers" has an interesting concept in its lyrics, about getting in touch with the other side. Again, it starts with an emotional intro, Bruce's vocals build up to a strong chorus, and the guitars really shine in certain areas, sounding very clean for a 3 guitar act. "The Mercenary" is a strong rocker in fine Maiden fashion, about a bounty huner, while "Dream of Mirrors" slows the pace down a bit. It reminds me of "Deja Vu" from Somewhere in Time, and it deals with the way nightmares and dreams can really effect some people. Starts off slowly, with Harris' bass leading the charge, leads up to Bruce's usual power chorus, and the pace really picks up about mid way through the song, which is a treat. "The Fallen Angel" evens out the slower songs again, a good vs. evil theme, with beautiful guitar work and vocals, and "The Nomad" slows it back down. A 'Lawrence of Arabia vibe' as Harris calls it, has a beautiful solo that Harris even did the keyboard work himself. Nice. "Out of the Silent Planet," which Bruce (needs to write more songs!) wrote, reminds me of mid 80s Maiden, and Harris bass charge is as good as ever. The album closes with "The Thin Line Between Love and Hate," and it's a fairly nice closer, althought not nearly as good as say Rime..or Alexander..but it has many different moods which make it worth listening. In the end, I must say that this is a nice way for Maiden to return. My only real gripes are that many of the songs start off with X Factor/Virtual XI lay outs, but Bruce's vocals sound as good as ever, the guitars shine throughout, and Nicko's drumming has improved a lot. Bruce and Adrian have returned! ..And so has Nicko!